I am definitively a breakfast person. I cannot leave the house in the morning without something in my stomach. I guess I get that from when I was a kid, my mom always made sure we had a healthy breakfast. Now that I am an adult, during the work week I like a simple in the morning, maybe cereal and toast, but on the weekends I like to make something a little special. 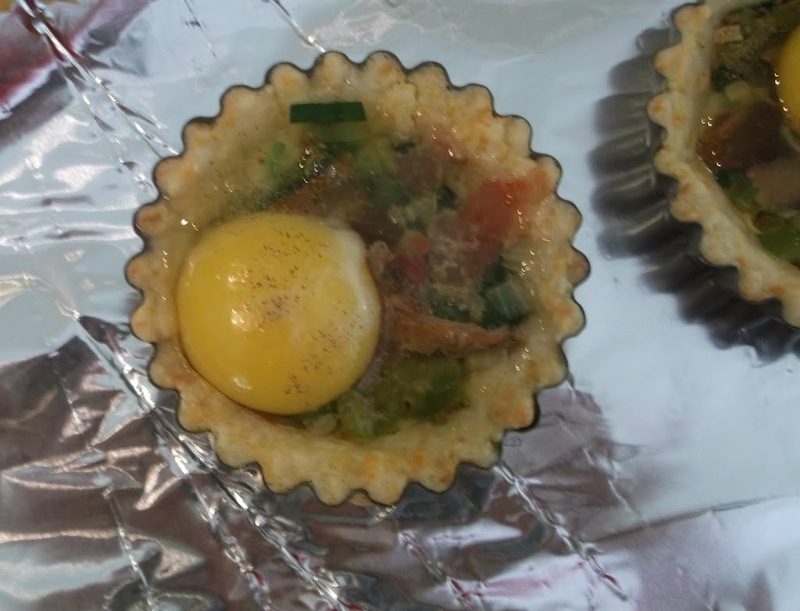 This past weekend I decided to use my new mini tart pans, for a savory egg tart. I found a cheddar pie crust recipe just perfect for this savory dish. Plus the fact that I have seen so many wonderful egg tarts on different blogs makes me wonder why it has taken me this long to try them out. I found an interesting recipe on the blog Apron Strings that was somewhat like I was looking for. I did change the ingredients some, the recipe on this blog did not include any meat and I really wanted to add bacon to my dish. 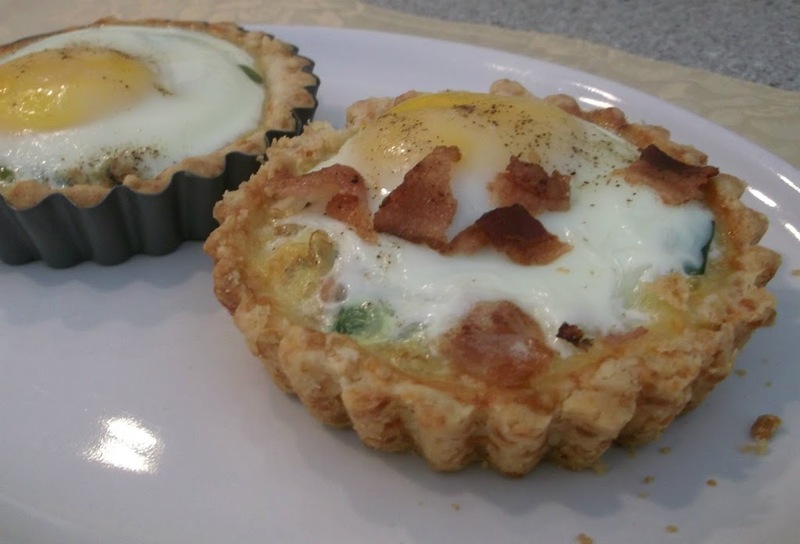 The crust was amazing with the cheddar cheese; it was a perfect choice with the eggs, bacon, and the few veggies that went into this tart. Toss together in a bowl all of the above ingredients. Cut in the butter and cheese with a pastry blender of a fork to the consistency of coarse crumbs, the press together with your fingers and knead in the bowl until a cohesive dough forms. Flatten the dough in a disk, wrap in plastic, and refrigerate until firm but malleable, about 30 minutes. Press into tart pans and bake in 420 degree F oven for about 5 minutes. They will finish baking with the once the eggs are placed in the shell. Heat olive oil over medium heat. Saute onions and green peppers until tender about 2 to 3 minutes. Add to this the spinach and chives continue to cook another 2 to 3 minutes. Divide the mixture between the tart shells and top the mixture with the crumbled bacon. Crack on egg on top of each tart. Season with salt and pepper to taste. Bake in a 425 degree oven for about 8 to 10 minutes, more or less depending on how you like your eggs done. Serve hot. 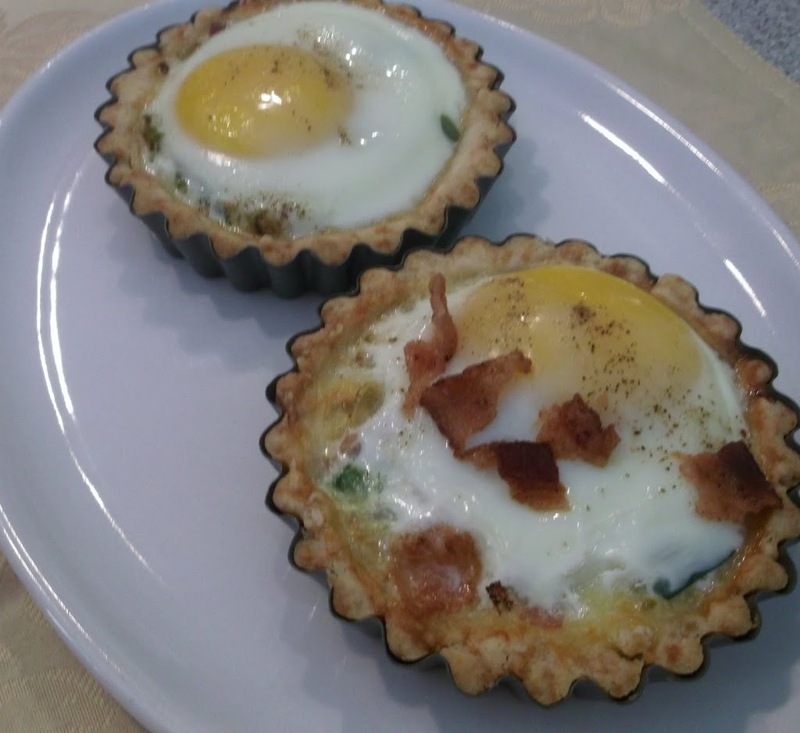 I am loving these little egg tarts – yum! The cheddar in the crust sounds great! I’d love to have these for breakfast tomorrow morning.